The field application of the roller mill is divided into three parts, and at the same time, as a precaution in the use of the high-pressure roller mill, I hope to help you. (1) The high-pressure roller mill must be densely fed during use. If the feed is loose, the uneven force on the roll surface will reduce the life of the roll surface. (2) The high-pressure roller mill must have proper powder in the feed, not only the material on the screen, otherwise the life of the roll surface will be greatly reduced. (3) The high-pressure roller mill should be evenly fed, otherwise it will cause the squeeze roller to deflect and reduce the extrusion effect. In severe cases, the host will jump. If there is metal in the feed of the high-pressure roller mill, the life of the roll surface will be reduced. If the metal near or larger than the roll gap size is fed into the high-pressure roll mill, the partial roll surface load will be too large, resulting in damage to the stud or roll surface. If there is metal in the feed to the high pressure roller mill, the following measures can be taken to protect the roll surface. (1) Install metal detectors and iron removers on the feed belt of the high pressure roller mill. (2) If it is closed-circuit screening, the iron remover can be installed above the discharge end of the material on the sieve. At this time, the material on the sieve is in a loose state, which can effectively remove the magnetic metal minerals therein. 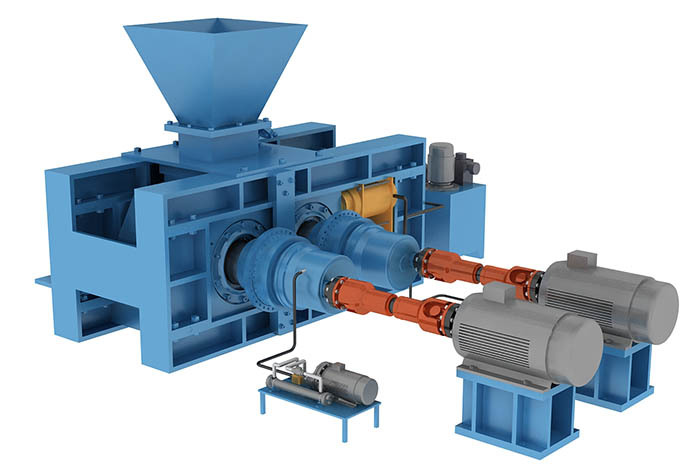 (3) In the self-grinding/semi-self-grinding machine process, if the cone crusher and the high-pressure roller mill are combined as a hard stone crushing device, a curved iron remover can be installed at the discharge end of the mill (only for non-magnetic and weak magnetic properties) Mineral), de-ironing the self-grinding/semi-self-grinding machine, and installing metal detectors and iron removers on the subsequent return belt to ensure that all metal materials in the return material are removed. (4) In the iron removal system, the iron remover should be used in combination with the metal detector, because the iron remover can only remove the magnetic metal in the feedstock, and for the non-magnetic metal, it should be manually removed by the metal detector. At present, many conditional mines have set up a bypass system in the high-pressure roller mill system, which can not delay production when the high-pressure roller mill fails, periodically repairs and replaces the roller surface. The bypass system is suitable for three-stage closed-circuit crushing + high-pressure roller mill ultra-fine crushing process, in high-pressure roller mill parking or under certain special conditions (such as continuous rain, excessive air humidity, high-pressure roller mill running poorly), materials It can be directly fed into the subsequent ball mill to make the production continuous.